The question is whether a bicycle or motorcycle rider injured in a collision with another vehicle while not wearing a helmet can file a personal injury claim to recover compensatory damages. My answer is yes, in all cases the injured rider is entitled to file a claim but may not be entitled to complete compensation for head or neck injuries. Many state laws require motorcyclists to wear helmets. These laws can affect their entitlement to recover damages for head and neck injuries in motorcycle accidents. Recovery depends on the state motorcycle helmet law, the details of the injuries, and whether the injured motorcyclist wore a helmet. There is clear evidence that motorcycle helmets significantly reduce the incidence and severity of head and neck injuries from accidents. The National Highway Traffic Safety Administration estimates that 37 of every 100 motorcyclists killed in crashes would have survived had they worn helmets. The helmet effect on nonfatal injuries is similar. For this reason, most states require motorcycle helmets for all riders in some states and for riders under a certain age in others. Only Illinois, Iowa, and New Hampshire have no motorcycle helmet laws at all. 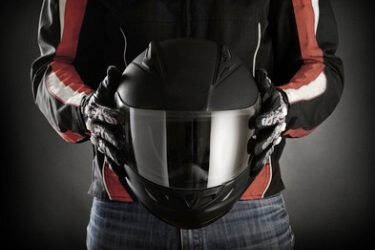 Head or Neck Injury Wearing A Helmet – The helmet is important to the claim. It shows no contributory or comparative negligence caused the injuries or made them worse. It also suggests that the injuries might have been worse, indicating how dangerous was the other driver’s conduct. Head or Neck Injury not Wearing A Helmet, No State Helmet Law – Recovery may be difficult even if the state does not require a helmet. If not wearing a helmet contributed to the severity of the injuries, there may be a finding of comparative negligence or partial responsibility for the injuries. Defendants can cite documentation of helmets reducing the incidence or severity of head injuries significantly. The claimant then must persuade the fact-finder that there would have been head or neck injuries even with a helmet. Bicyclists, however, may be more successful in this scenario. Bicycle helmets are not as obviously protective as are motorcycle helmets, nor is there as much clear documentation of their protective effects. No state requires helmets for adult bicyclists. If a bicyclist without a helmet sustains head injuries, the defendant must prove that a bicycle helmet would have prevented or mitigated them. There is no automatic establishment of comparative negligence as in a motorcycle case. The lack of a helmet may weaken but it does not end a bicyclist’s claim. Head or Neck Injury, State Helmet Law, not Wearing A Helmet. If the state requires a helmet, it is extremely difficult for a motorcyclist to recover damages for a head or neck injury. The state helmet law automatically establishes comparative negligence. A claimant still might be able to prove that the injury would have occurred even with a helmet; however, proof of such a fact is necessarily always difficult and if possible would require expert testimony presented by a skillful, experienced personal injury lawyer. Like most personal injury attorneys, I offer free initial consultations to evaluate cases and, if retained, will agree to work on a contingency fee basis where you pay no legal fee unless and until there is a recovery of damages from a settlement or an award. If injured with or without a helmet in a bicycle or motorcycle accident, contact a skillful, experienced personal injury attorney as quickly as possible.